On two separate March evenings, participants on Lloyd Center outings experienced firsthand the rigors of searching for night birds, and how beautiful the early spring landscape can be. 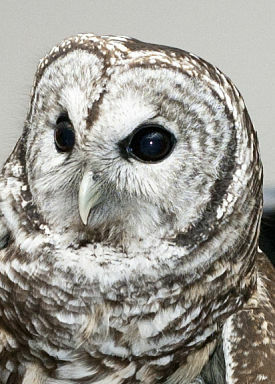 The Spring Owl Prowl occurred during a unique confluence of celestial events. A full moon coincided with the vernal equinox and “perigee”, the period when the moon is at its closest point to the earth as a “supermoon”. Because the wishes of Mother Nature determine activity levels of wild owls, our resident screech owl was brought before the sizeable group. With nightfall approaching, when owls are biologically attuned to begin exhibiting hunting behavior, Koko was noticeably fidgety and alert. The group saw how owls are structurally adapted to a nocturnal niche, and learned about unique traits possessed by screech owls. Then came the pursuit of owls on the property using callback tapes. The rising moon over the estuary seen through the still bare forest trees was so brilliant it captivated the group and made it easy to forget we were searching for owls. Those with a sense of humor might suggest the owl community was equally transfixed and awed into silence while watching the show! Whether it was the excessive light of the full moon and clear skies (overcast conditions are particularly good for owl activity), or some other factors, no owls were heard for much of the night. It wasn’t until the very end (when cars were starting to depart!) that a Barred Owl call “who cooks for you” rang loudly through the night woods, likely a bird drawn in from off the property. While the owl had the last laugh, the group gained an appreciation for the woods on a uniquely beautiful early spring evening and how elusive (and wise?) owls can be. A week later a similar event featured the fabled American Woodcock, known to many as the “Timberdoodle”. Complex habitat requirements, including mature and early successional forest, and open fields all in juxtaposition, mean the species requires intensive management, as occurs at Noquochoke Wildlife Management area where the walk was held. Actually a shorebird, the woodcock eats earthworms almost exclusively, and carries out elaborate courtship flights. After a leisurely walk around the property which featured a few robins, but was otherwise quiet on a cool night, folks settled in for the main event. As if hooked to a light switch, woodcocks begin activity at a very specific level of darkness and are active for only a brief time. While sightings at an area managed for the species are virtually guaranteed and the birds are less elusive than owls, the chase is still on… From where in the open field will the first bird call and take first flight? After 7pm when the darkness threshold was reached, the first nasal “peent” call was heard and soon other birds joined in along with the woodland edge. Finally, the silhouette of a bird was seen that appeared to want to land where we stood! After minutes of just calls, off in the northern reaches, aerial displays began. Dark figures rose into the darkening skies until out of sight, after which a twittering sound made during decent clued us in as to the landing spot. Woodcocks often land in the same spot all evening during displays. The bird we spooked eventually returned to its original intended spot in the middle of the waking path when we shifted our viewing location, offering a quick glimpse and a highly audible call at close range. However, most of the activity was further off toward the far edge of the field. A Great Horned Owl hooted in the distance, also making its presence known. See you on other future Lloyd Center outings held on the property and beyond!